“This town (Washington) is full of people who call themselves ambassadors, and all they did was pay $200,000 or $300,000 to the Republican or Democratic Party,” says the well-known criminal defense lawyer Robert Bennett, referring to a passage in the criminal complaint filed against the Illinois governor suggesting that Mr. Blagojevich was interested in an ambassadorial appointment in return for the Senate seat. 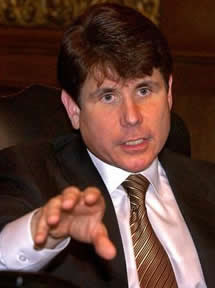 “You have to wonder, How much of this guy’s problem was his language, rather than what he really did?” Gov Blagojevich was reportedly wire-tapped by the FBI as saying, "I've got this thing (the senate seat) and it's f------ golden, and uh, uh, I'm just not giving it up for f------ nothing." According to the New York Times, Mr. Bennett says that the Illinois Governor Blagojevich's corruption case raised some potentially thorny issues about political corruption. It seems to me that political campaign contributions routinely buy favors such as favorable legislative votes or policy decisions or significant political appointments by elected officials. However, this is done in a manner that avoids the explicit mention of quid pro quo in any conversations or writings. A nod and a wink is often sufficient for such a transaction to keep the prosecutors away. If what the prosecutors claim Balgojevich did is proven in a jury trial as criminal violations of the law, it would be because of how Blagojevich chose to do it rather than the substance of what he really did. Political corruption in Washington is believed to be the root cause of the current international financial crisis, the worst since the Great Depression that started in 1929 and lasted through the 1930s. Clearly, the unanimous Senate passage of the Commodity Futures Modernization Act of 2000 demonstrated the power of Wall Street over both Republicans and Democrats. In fact, the data of the financial services industry's recent campaign contributions shows that two of the top three recipients of the largess from Wall street are Democrats Barack Obama and Hilary Clinton. John McCain is in a distant third position. Overall, Sen Obama's campaign is awash with record, massive cash contributions. Since the current financial crisis has its roots in easy, plentiful mortgages and the housing bubble facilitated by the Democrats' unabashed and reckless support for home ownership via Fannie and Freddie and community re-investment legislation, a larger share of the blame for the current crisis should be assigned to the Congressional Democrats such as Barny Frank and Chris Dodd. Both Fannie and Freddie have been major campaign contributors to key politicians in Washington. If Blagojevich is convicted and jailed, it would simply offer a lesson for other politicians to be wiser about how they exchange favors for campaign money rather than deter them from engaging in the rampant pay-to-play political corruption in America. As far as campaign money is concerned, the rules for how it can be used by politicians are loose enough that it amounts to personal enrichment for maintaining power and expensive lifestyles. If the Blagojevich case goes to trial, it may help bring the spotlight on the culture of political corruption in America. In terms of government corruption, the US is currently ranked at number 20 on a list of 179 nations by Transparency International, worse than most of the countries of Western Europe and Japan. If the American politicians' common practices are redefined as criminal rather than mere political horse trades, then the US corruption ranking will likely slip further.